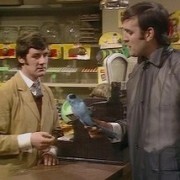 An immortalised example of refayned speech is the 1969 Parrot Sketch from Monty Python’s Flying Circus, in which a disgruntled customer (John Cleese) takes back to a pet shop a parrot which has just been sold to him dead. 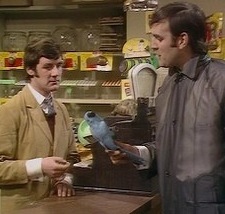 Cleese’s character uses an ornately high-class register mixed with nonstandardisms, e.g. “I wish to complain about this parrot what I purchased not half an hour ago from this very boutique.” Phonetically, he has the refayned combination of Popular London features (h-drop, glottaling, –ing as [ɪn], etc.) with the hypercorrected PRICE vowel. Wells’ 1982 feeling was that refayned speech “is nowadays perhaps not so often encountered as it used to be.” Thirty years on, I’d say that refayned speech, like the parrot, is no more. It has ceased to be, expired and gone to meet its maker. It is an ex-accent. For a long time RP and its speakers had unique prestige, sufficient to motivate hypercorrections like the refayned PRICE vowel. Another example, from my own native region of Merseyside, is the shift of the neutralised NURSE-SQUARE vowel from a pronunciation like standard NURSE to one like standard SQUARE. Thus swear word has shifted from earlier [swəə wəəd] to contemporary [swɛɛ wɛɛd]. In my youth, speakers who shifted struck me as snobbish, anxious to escape from the negative connotations of [əə] in fair and hair – but over-applying the change, of course, to fur and her as well. Back then, by analogy with “refayned”, we might perhaps have tagged this innovation as “airbane”. Today it’s just the default Merseyside pronunciation. Of course we still distinguish between high class and low class talk, and there’s still comedy mileage in the clash between the two. Russell Brand’s comic style today, like the pet shop customer’s over forty years ago, relies on high-flown turns of phrase in a demotic accent. But Brand’s accent doesn’t hypercorrect. Phonetic prestige is now more complex than it was, as shown by much-discussed phenomena like “Mockney” (mock Cockney). A Londoner who shifts to [ɛj] in PRICE words today is not overshooting RP – contemporary standard BrE has moved in the opposite direction – but rather is adopting Multiculturla London English (or speaking “Jafaican”, fake Jamaican). Would any British accent group today initiate a shift designed “to sound as if one belonged to a higher social class than one really does”? I don’t think that it’s any coincidence that “rayned” and broad Cockney died out around the same time. There cannot be many Londoners left who use [ɒɪ] in PRICE. Spelling mistake above. It should say “refayned”. You’re right that the refayned accent couldn’t continue in the exact form demonstrated by John Cleese (or Parker in Thunderbirds) once the stigmatised and/or the prestige sounds had changed. In particular, the first element of PRICE, so different in Cockney and RP, is now roughly the same in Standard British and Popular London-Essex. But, whereas Cockney has its successor(s), I think refayned speech qua “unsuccessful attempt to sound as if one belonged to a higher social class than one really does” is dead and buried. I remember distinctly hearing another hypercorrection from the convent-educated daughter of a working-class South-East London family who asked me one evening (late 60’s/early 70’s) whether it was /ri:nɪŋ/ when I arrived. I had to ask her several times to repeat the question before I suddenly realised she was asking if it was /reɪnɪŋ/. I do not think think I had ever heard this form before, nor have I heard it since, but it seems to me that it may be analogous to /rɪfeind/.